Born in Allen Township (now East Allen Township), George Wolf was the son of German immigrant farmers. His father, along with other local farmers, joined together to build the Allen Township Classical Academy in 1785, providing a formal education for the young men of the community. This building has been known as the “Wolf Academy” since the turn of the 20th century. George Wolf’s early education was at this school, and he later became its principal. After studying law with John Ross of Easton, Wolf was admitted to the Northampton County Bar in 1798, the same year he married Mary Erb. The Wolfs were the parents of eight sons and one daughter. Wolf was appointed postmaster of Easton in 1802, clerk of Northampton County Orphans Court from 1804 to 1809, and was elected to the state General Assembly for one term in 1814. He was defeated in the state senate election in 1815, and spent the next nine years practicing law in Easton. 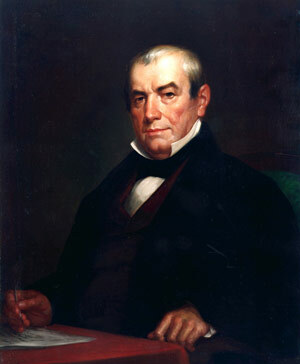 In 1824, he was elected to the US House of Representatives for three terms. In 1829, Wolf was elected Governor of PA, and won reelection in 1832. In 1834, the long awaited Common School Law established the first statewide system of publicly financed education, which was a top priority for Wolf. After he lost his bid for a third term, President Andrew Jackson appointed him first comptroller of the Treasury of the United States. Two years later President Martin Van Buren appointed Wolf collector of customs for the Port of Philadelphia, a post he held until his death in 1840. Wolf’s most important contribution to Pennsylvania, the passage of the Common School Act, provided a basic education to all children of the state, without regard to a family’s wealth or social status. Today many schools across the state are named in honor of George Wolf, “Father of the free school system”, a monumental legacy for a Northampton County, PA farm boy.